Garrett GT and GTX upgrade turbo oil feed line kit for the Ford EcoBoost 2.3L engine. Compatible with 2015+ Ford Mustang EcoBoost 2.3L. 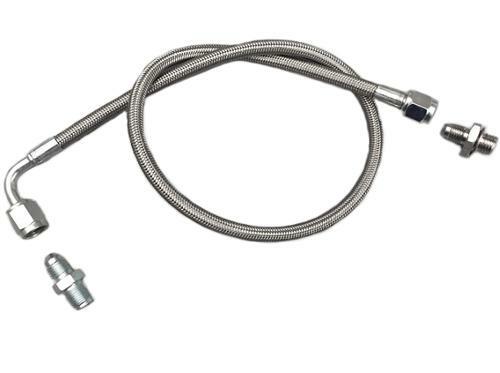 The oil feed line kit includes a steel braided line with a restricted oil feed fitting for the turbo and an adapter fitting for the stock oil feed source. The oil feed line kit is an excellent solution to install a steel braided oil feed line for a custom ball bearing Garrett GT or GTX series upgrade turbocharger to the Ford EcoBoost 2.3L engine. Simply, remove the existing oil feed line, install the adapter fitting into the stock oil feed source, install the oil feed restrictor fitting into a ball bearing Garrett GT or GTX turbo, and attach the steel braided line to both fittings!